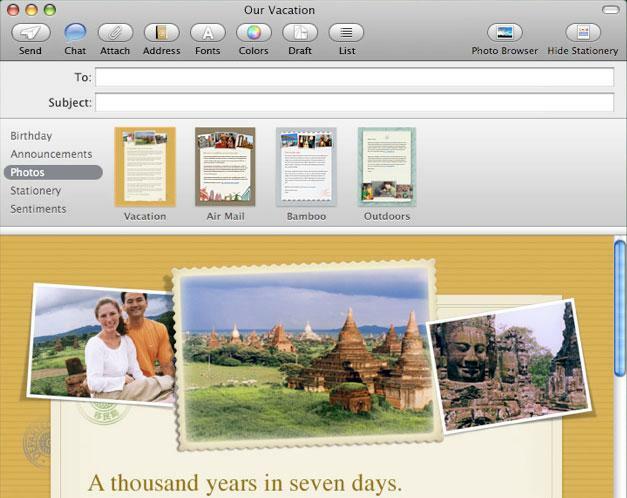 In Leopard, Mail 3.0 (below) gets its biggest leap forward yet. Its window follows the unified Leopard window appearance, with squared off window corners that look like more like iTunes. As with earlier releases, many of its new enhancements come from integration with other new or improved services in Mac OS X. For example, the new stationery features build in a sort of mini-iWeb for creating nice looking HTML emails that embed the user's own photos into one of a variety of supplied templates. Templates are invisible unless you tap on the Stationery icon in the toolbar, so if you hate the idea of HTML emails, you won't even know its there. Until, of course, you start getting them from your mom. 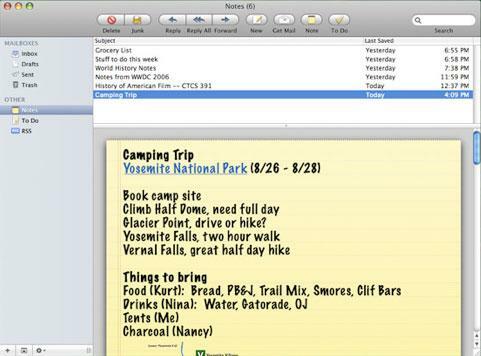 The Stationery-based HTML emails look good in any modern email client on the Mac or PC, including the iPhone's Mail. 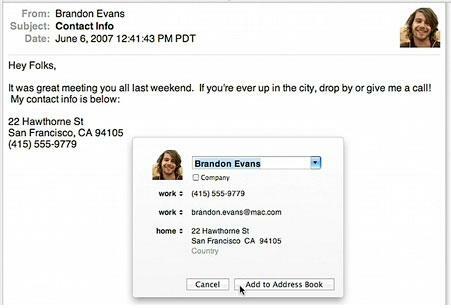 Mail 3.0 also plugs in to the new Calendar Store in Leopard, which manages a system wide, shared repository of calendar and event information in the same way Address Book manages a central pool of contacts. This allows Mail (as well as third party applications) to interface with the same selection of To Do reminders as the new iCal presents. Select a section of text within an email describing an event or objective, right click, and select "New To Do" to convert the selection into a calendar reminder. Why do this in Mail? It's not just a novelty. To Do reminders are linked to the message you created them from. From your To Do check list, you can click on an iTunes-like arrow (above, at the right end of the To Do titles) to bring up the email you linked it against. That makes the To Do a sort of organized, hyperlinked flag for email messages. Since a To Do is a standard event, it can be assigned a due date (below) with reminder alarms, a set priority, and a calendar, so you can keep your events separated and organized, synced across systems, including —shortly —your iPhone. Another cool feature in Mail is Data Detectors, which originated in Apple's Advanced Technology Group research lab in the mid 90s as a way to isolate useful information from a document, such as harvesting email addresses from a text file. Apple Data Detectors are back in Mail 3.0. Emails in Mail that contain a date, phone number, or a contact (such within an email signature) are tagged with a drop down menu. Click on it and select "Create New Contact," and Data Detectors will scrape together as much as it can from the email: the name, mailing address, email address, phone and fax numbers, and copy them into a contact entry ready for your editing (below). Mail 3.0 also gets Notes, which are HTML scratchpad emails with rich text, hyperlinks, and graphics or file attachments. They act as specialized email drafts, and can similarly be linked to To Do reminders, so a simple event can bring up a more detailed outline contained in a Note. Following an upcoming iPhone update, they'll be the way to sync ideas between your mailbox and your mobile. That can already be done today with draft emails, but Notes makes it more accessible than digging around between mailboxes, and separates the and stylizes the idea of a note from an email draft. 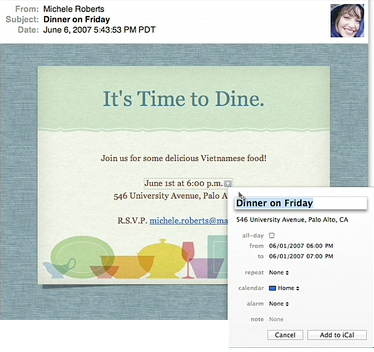 The contents of a Note can also be forwarded as an email. 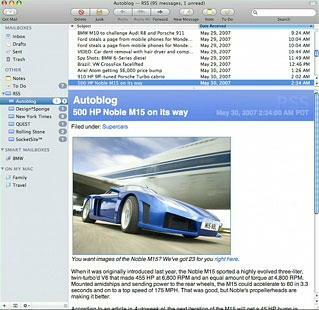 While Apple already added support for parsing RSS feeds into Safari, Mail 3.0 offers to act as a simple RSS feed reader. That allows you to review new articles from your favorite websites (or podcasts) in the same context as your incoming emails. With all the new stuff in the sidebar, Apple's given Mail's iTunes-like "source list" a feature that doesn't appear in iTunes, or any other application sporting a sidebar, such as the new Finder: Mail 3.0 can rearrange its main sections (such as Mailboxes, Reminders, Smart Mailboxes, and RSS feeds) by drag and drop, just as the existing Tiger version can rearrange mail folders. That lets you customize Mail to suit however you chose to use it.